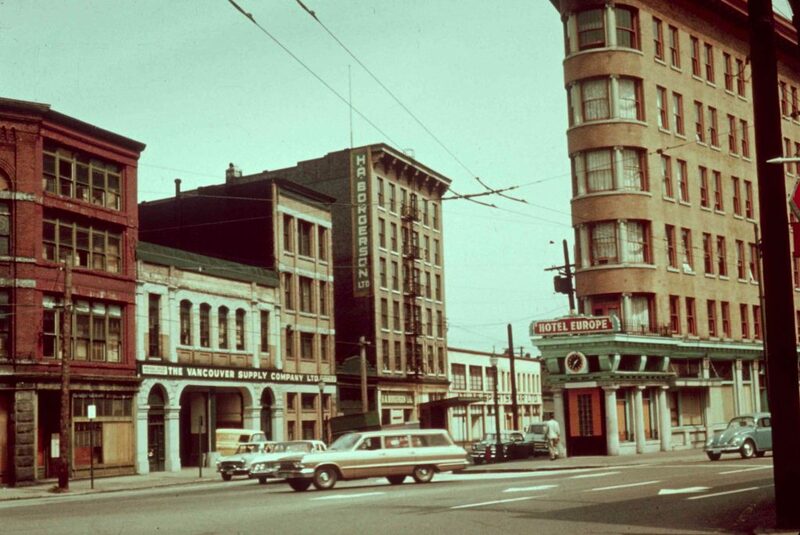 The 1960s were a time of change, and in Vancouver it was no different. The city went through some radical developments during that decade as high-rises sprung up, older areas of the city faced demolition and buildings were repurposed for different uses. Read on to see how those changes played out visually. Downtown Vancouver looked a lot different in the 1960s than it does today — the biggest difference? Building height! 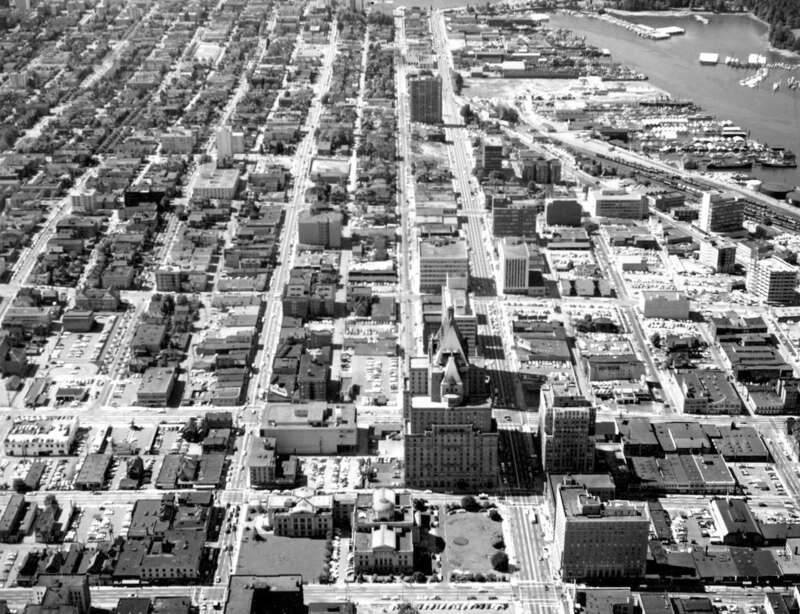 Today many downtown streets are permanently shaded by huge buildings that hadn’t been built in the ‘60s. Cordova Street is one of Vancouver’s most photographed streets, and it’s not hard to see why — it runs through some of the city’s most popular areas, including Coal Harbour and Gastown, before leading into Powell Street. 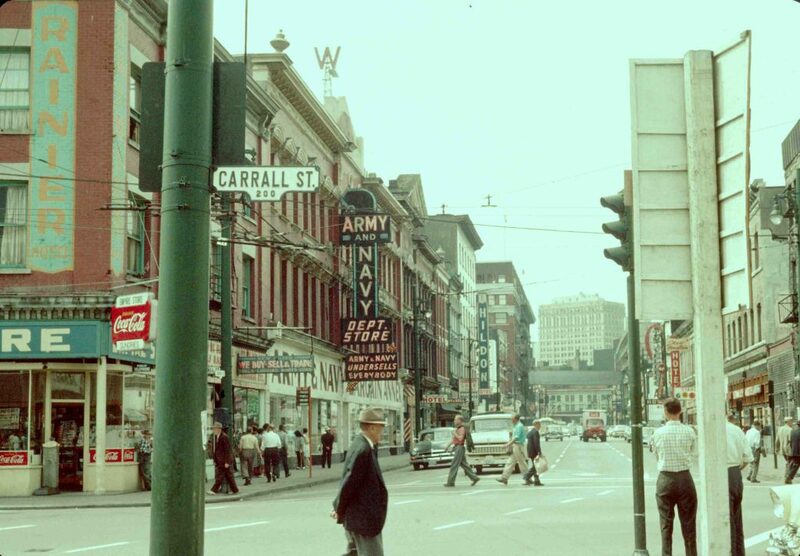 The photo above was taken at the intersection of West Cordova Street and Carrall Street, and shows the longstanding Army & Navy store — still present today. 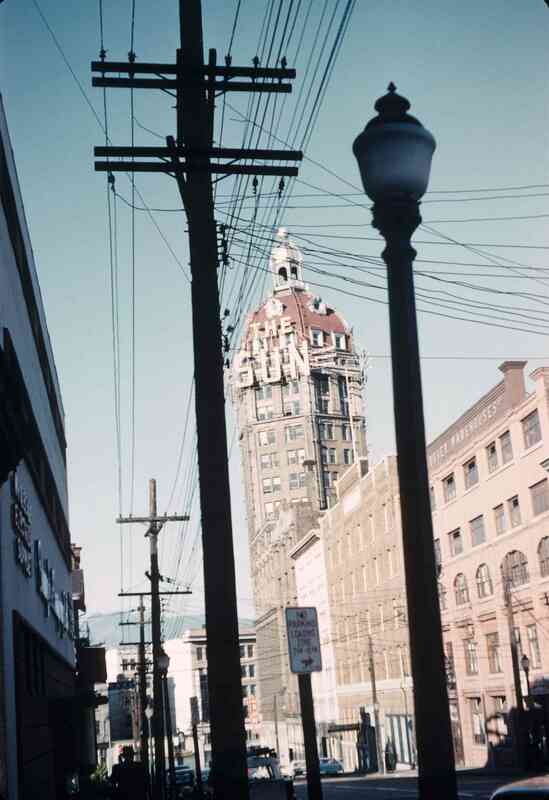 Taken not far from the intersection of Beatty Street and Dunsmuir Street, this photo shows the Sun Tower. Built in 1912, it was originally home to The Vancouver World newspaper, and for a time was the tallest building in the British Empire. 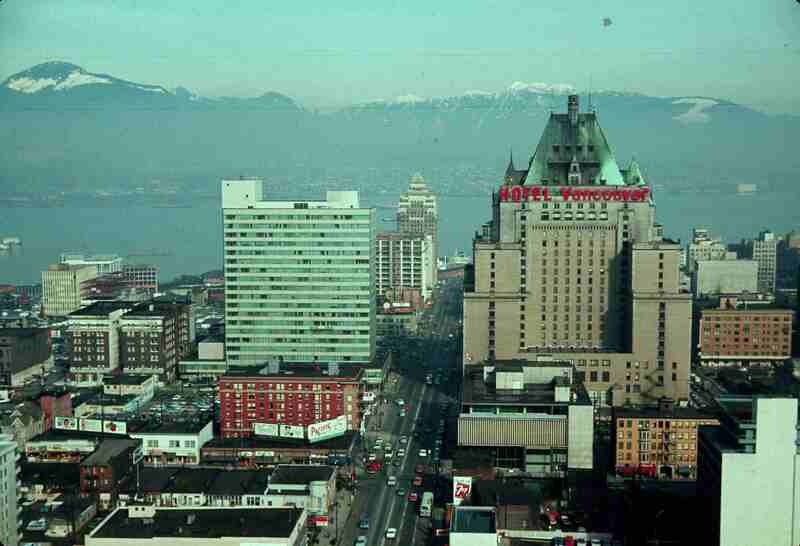 By the 1960s, The Vancouver Sun newspaper had taken over the space and given it the name it goes by today. 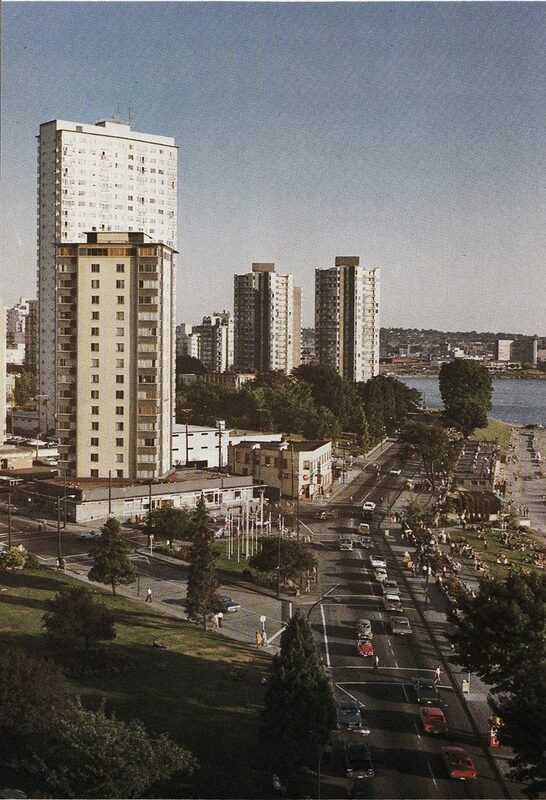 Many things have changed in Vancouver in the last few decades, but not the beachy appeal of English Bay. 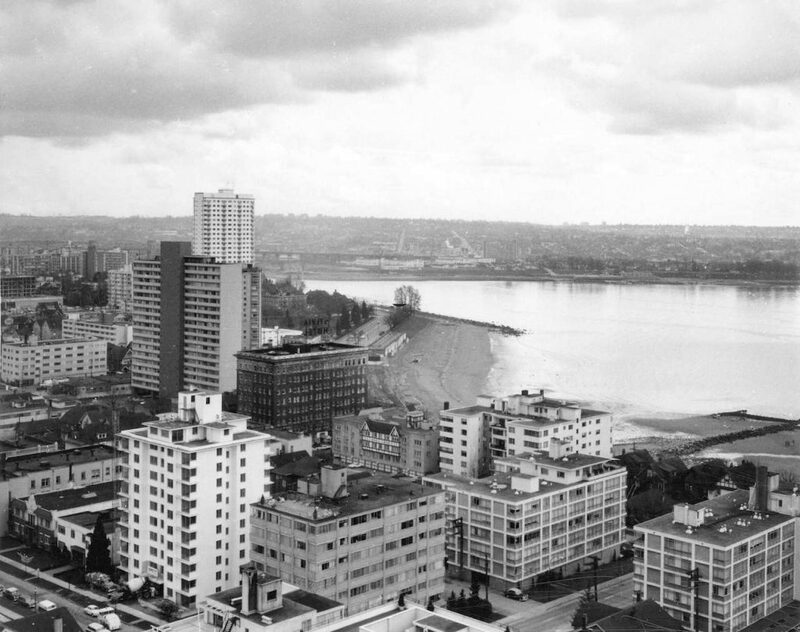 Sand was added in 1898, and by the time the 1960s rolled around the area was an established summertime haunt for many Vancouver residents. 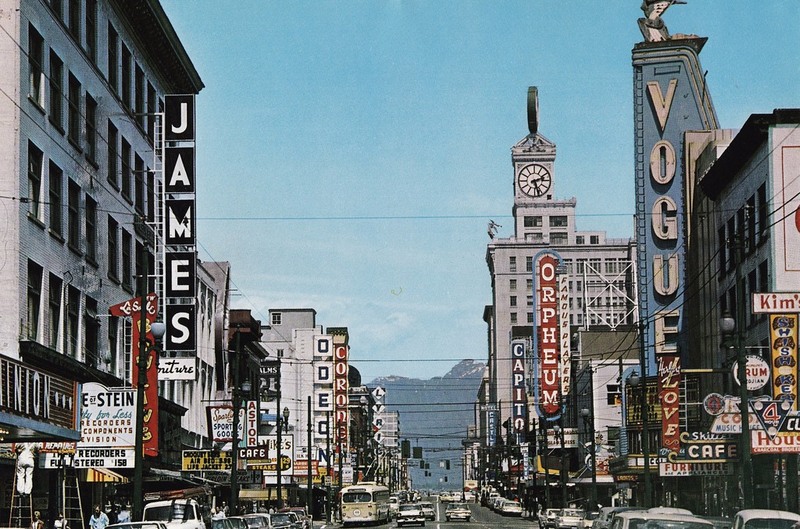 This stretch of colourful Granville Street was once known as “theatre row” and was home to various movie theatres, including the Vogue, the Orpheum, Capitol, Coronet and the Odeon — all visible in the photo above. Today, there are no movie theatres operating along the stretch, although venues like the Vogue and the Orpheum have been repurposed for live events. The Hotel Vancouver, located in the heart of downtown and now branded as the Fairmont Hotel Vancouver, is the third hotel in the city to go by that name. The first was a much smaller five-storey brick building, and the second, built from 1912 to 1916, was turned into a government administration building during World War II and then torn down. 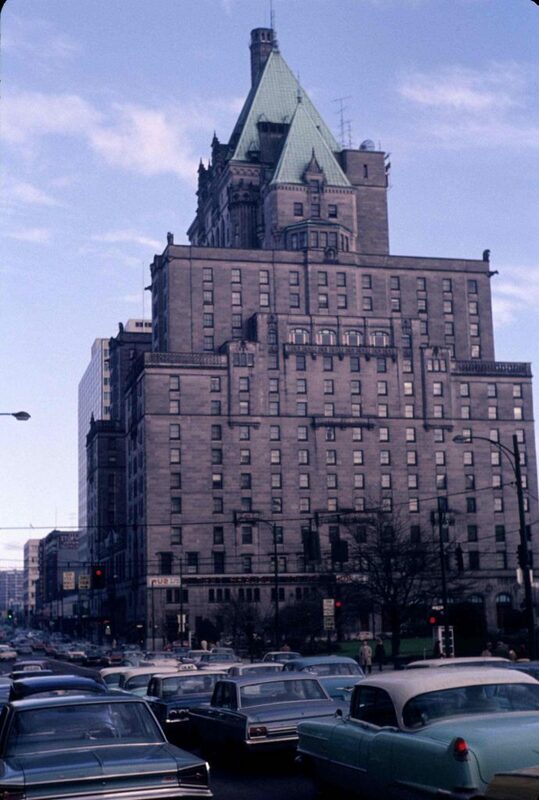 This third Hotel Vancouver opened in 1939 at a final cost of $12 million. The Hotel Vancouver is visible from a different angle in this aerial view of downtown Vancouver taken in 1966. Burrard Street is the street running through the middle, and the former Vancouver Public Library can also be seen — since then it’s been relocated to West Georgia Street. 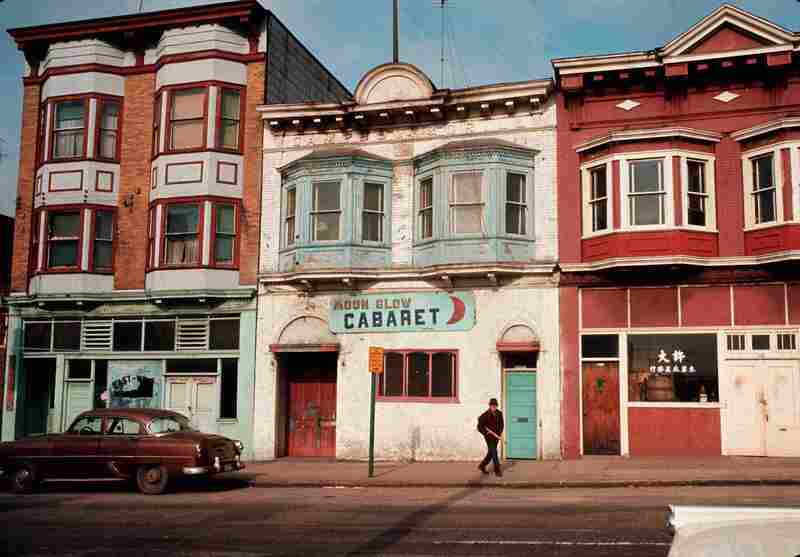 The Moon Glow Cabaret and many other businesses and buildings in Vancouver’s Strathcona neighbourhood were wiped out during the 1960s. Starting at the end of the 1950s, three levels of government teamed up to acquire and clear property in the area to make way for public housing projects. The first phase of redevelopment started in 1960, and despite protests from the community, the second phase began in 1963 — an end didn’t come until 1968, when neighbourhood associations were able to put a rehabilitation program in place. Gastown, the location of the Hotel Europe, also faced some turmoil in the 1960s — like Strathcona, as well as Chinatown, it was scheduled to be redeveloped during that time. Ultimately campaigners were able to convince the government to reconsider, and Gastown was declared a historical site in 1971. 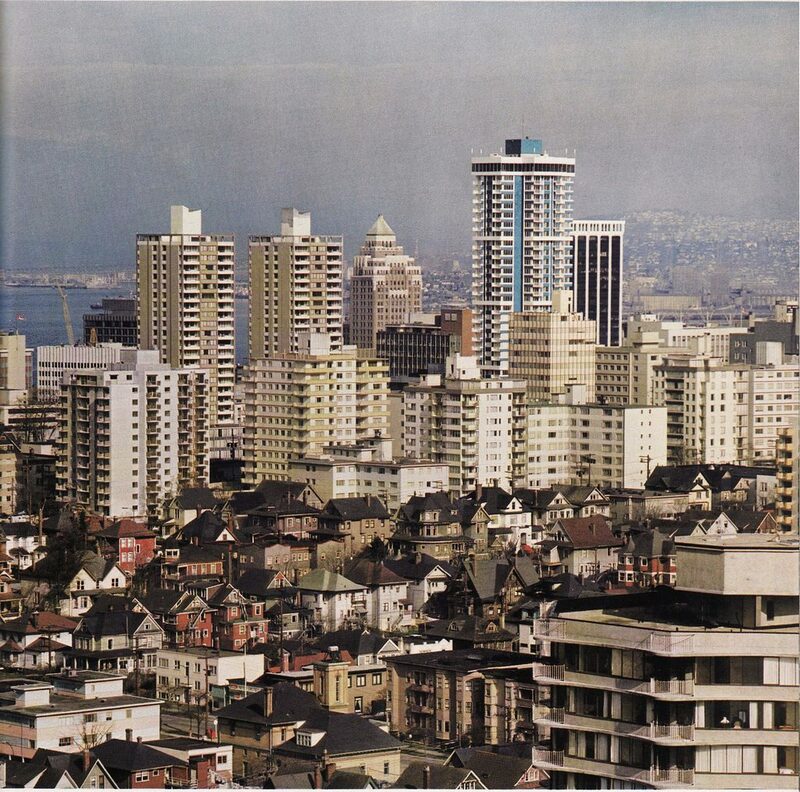 This photo of Vancouver’s West End was taken in 1967, during the boom in high-rise apartment construction that took place from 1962 to 1975. During that period over 220 high-rises were built, drastically changing the look of the neighbourhood, and eventually prompting the creation of local planning programs. If you’ve ever attended the annual Celebration of Light fireworks displays, you may recognize the intersection shown in this 1967 photo. It’s right beside English Bay Beach, a prime location for viewing the fireworks. 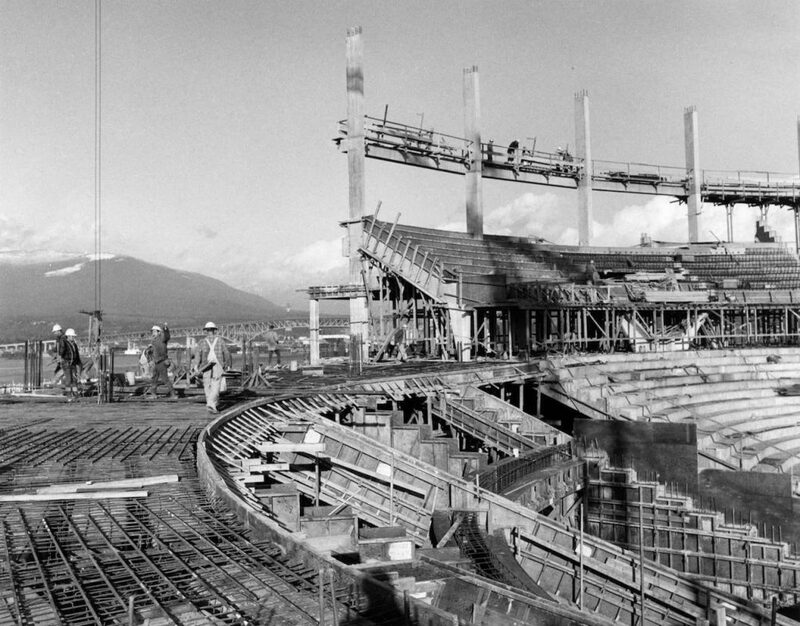 The Pacific Coliseum is now a well-known part of Hastings Park in Vancouver’s Hastings-Sunrise neighbourhood, but back in the 1960s it was only just being built. 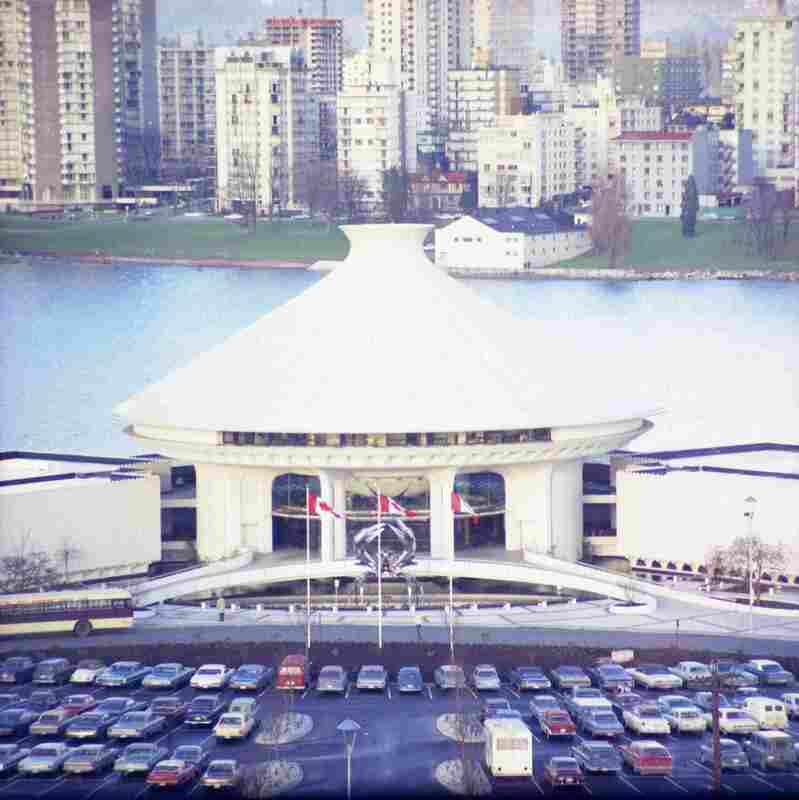 It was completed in 1968, the year after the photo above was taken, and has gone on to host a diverse array of events, including figure skating and short-track speed skating during the 2010 Olympics. 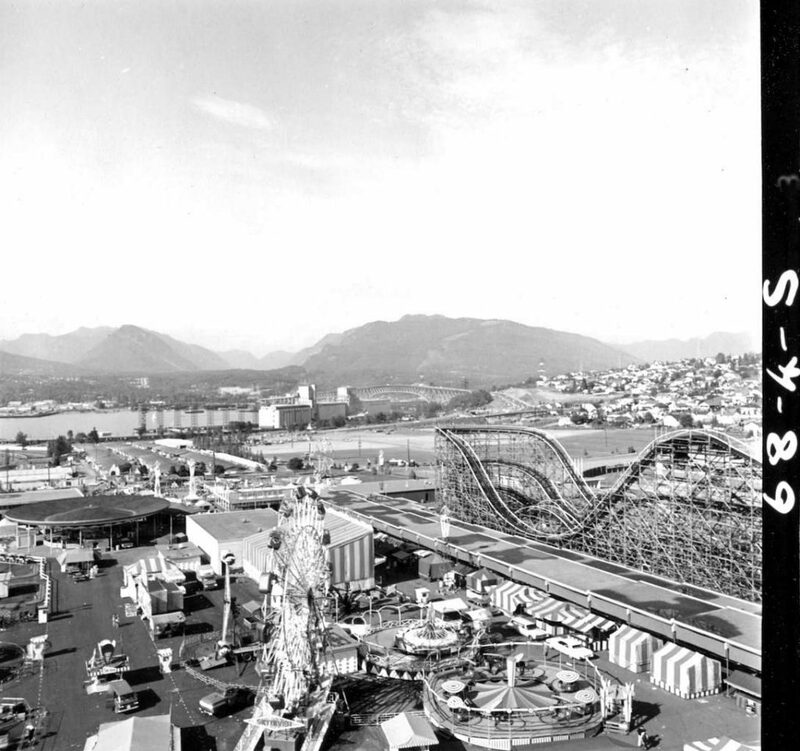 Also located in Hastings Park, the Pacific National Exhibition (PNE) grounds were an established part of Vancouver life by the 1960s. The grounds play host to the Playland amusement park, as well as the yearly Fair at the PNE. You may recognize Playland’s wooden roller coaster in this photo — built in 1958, it’s still one of the park’s most popular rides. Located across False Creek from the West End and downtown, the planetarium — formally known as the H.R. MacMillan Space Centre — opened in October 1968. The building was a gift to the city from lumber magnate H.R. MacMillan, who was inspired to provide it by the dawn of space exploration. It remains a community resource today. 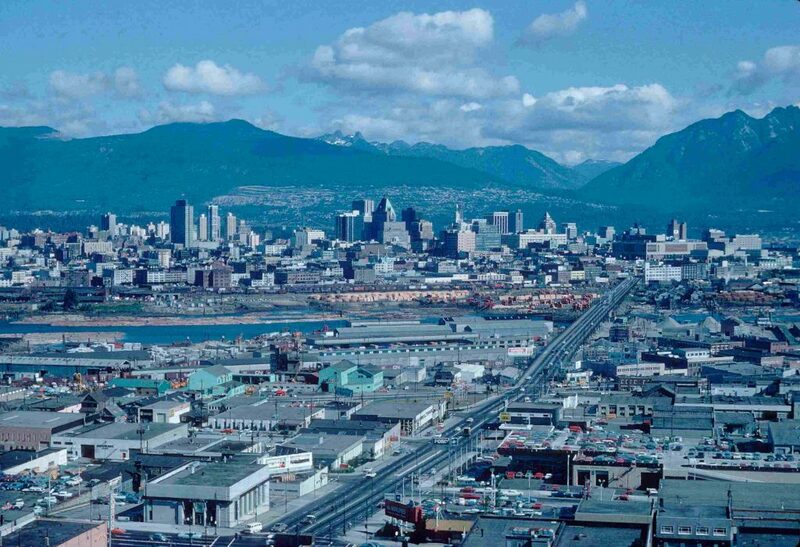 Downtown Vancouver is already looking much different in this 1969 photo than it did in 1960. The skyline is beginning to develop, and the city that Vancouverites know now is definitely starting to take shape.